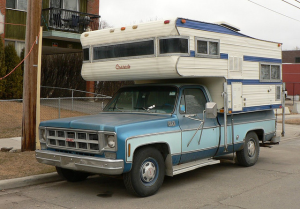 A pickup truck, van, or other vehicle outfitted with sleeping and sometimes cooking facilities. Campers range in sophistication from trucks fitted with "toppers" to luxury recreational vehicles (RVs) and motor homes. "A GMC pickup with a camper shell from circa 1973, photograph dated April 1, 2006" by James Tworow is licensed under CC BY-NC-ND.